With Swirls of Orange Zest on Top. The anticipation mounted, as we entered into what I thought was a shopper's paradise, our local mall. The scents would change as you weaved your way though a maze of people. First would come the smell of "new clothes" with all their chemicals. Then the aroma of freshly baked gingerbread, only to be followed by the whiff of leather. My eyes remained peeled and my nose followed the fragrance, as I looked for the Orange Julius cove. We did not go often, as this was a luxury for our family. The delight was all mine when I sipped on the frothy, orange whipped beverage. Not long after I learned to make my own Orange drink that our family enjoyed often. 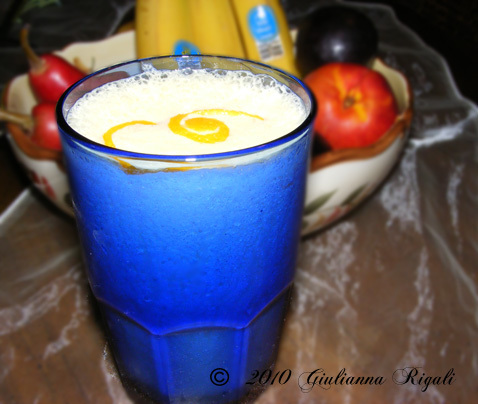 Back then I called it Orange Julius even though it is definitely not the same, but possibly better. :) Years later, family started calling it Orange Giuli/Juli. So the title changed. Then my kids began calling it Orange Mommy, because they were too little to remember my name was also Giuli/Juli. Hee hee. These days I make all flavors of Frappio Doppio (Frappucinnos), but my family and friends still request what is probably one of my signature drinks. Since I have been gardening and cooking Italian, my son proposed a name change to the drink to include Giulianna instead of Giuli or Mommy. Now we have Arancio Giulianna, but it will ALWAYS be "Orange Mommy!" Frappe on high for about 30 seconds in a blender. Stop and stir and blend again for another 15-30 seconds. Serve ice cold! Makes about 3 glasses. Optional: Here are variations you can try out as you please! Grape concentrate in place of the orange, a couple of scoops of ice cream, heavy whipping cream partly replacing the milk, cinnamon or cloves instead of vanilla, confectioner's sugar in place of the sugar.